Letter to Martha Berry from A. C. Floyd informing her that when she canceled her subscription to Atlanta Journal that she had a balance left over. She is asked to mail in the money at her earliest convenience. 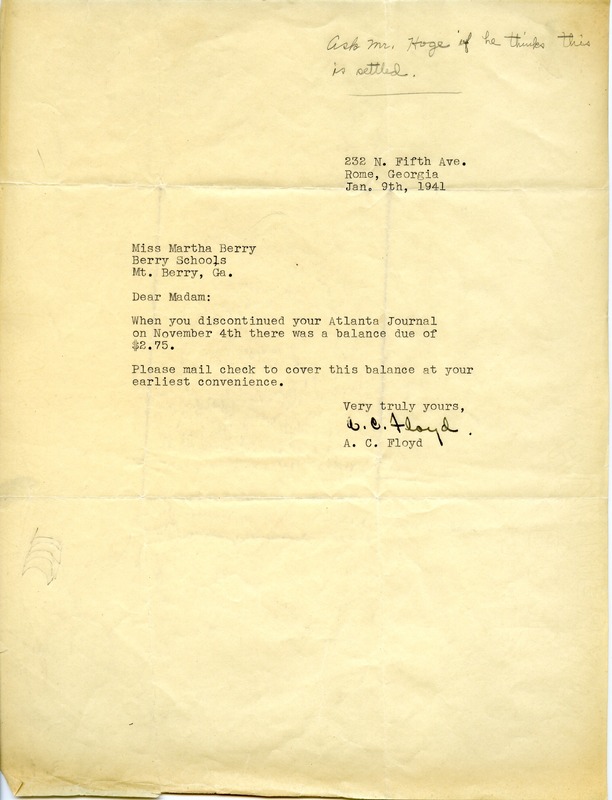 A. C. Floyd, “Letter to Martha Berry from A. C. Floyd.” Martha Berry Digital Archive. Eds. Schlitz, Stephanie A., Jordan Brannen, Haley Fortune , et al. Mount Berry: Berry College, 2011. accessed April 18, 2019, https://mbda.berry.edu/items/show/445.